Even good times must come to an end, and Aria the Origination is the ending that will give you full of emotions as you watch the trio become Prima Undines. It is a wonderful ending to a captivating and magical series. Welcome once more to Neo Venezia; the city that personifies warmth and tranquillity. A journey must be taken starting from your first step and the journey ends until you have reached your goal. 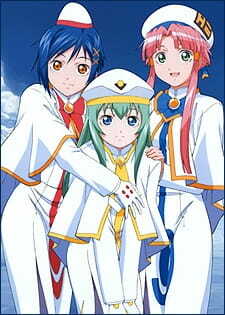 Aria the Origination highlights this fact and presents a slow crescendo to a wonderful and emotional finish. The story is once again about the everyday life of these three girls as they explore even more of Neo Venezia and show their true potential of become great Undines. With each episode you will be anticipating the "day" when they finally become Prima Undines. You will also get to experience more wonders of the city and clear relationship developments of the characters in this final series. The finale is both happy and sad at the same time; happy because they finally become Prima Undines and sad as they all follow their own paths towards their dreams. The art was improved into high definition for this series. This added greater depth and detail to the backgrounds and sceneries as well as to the characters themselves within the anime. As mentioned in previous reviews, the Aria series' always had this "magical" effect that seem to make this anime come alive; and Aria the Origination does just that. Voice acting was once again perfect with the same cast as with the sequels. The theme songs were dreamy, slow-paced, and quite relaxing to listen indeed. The subtle ambient music is also back with slow strums of melodious guitar pieces and the sounds of the ocean. These elements also make the city feel more "alive" throughout the anime. More character development is shown here with the finale presenting us with Akari, Aika, and Alice in becoming Prima Undines one after the another. As events lead up to those special days, we see some doubts and fears that these girl have with becoming a Prima Undine. Will we still be friends? Will we see each other again? These questions are always lingering in the minds of these characters. In the end, everything works out and they overcome their fears with the help of each other. Overall, it was nice to see a good ending to an engaging anime series. No doubt you would have felt some connection to the anime and to the characters themselves after watching the entire Aria series. For those who want to experience this magical experience, the best place to start would be Aria the Animation. My advice would be to not to speed watch the Aria series or else it would ruin the slow-paced, relaxing experience for you. This is one anime you want to spend a lot of time on and to slowly take in the details of the anime. It was a wonderful ending to a relaxing series. The art was improved this time with a high definition version. Voice acting was perfect and the theme songs were nice and catchy. Superb use of background music here. We come to love the characters throughout the series and Aria the Origination reveals one last time the character's thoughts and emotions. In the end, it was one big happy ending. Everyone manages to follow their dreams and get their wishes fulfilled. If you have watched the other Aria series then you definitely must finish off with Aria the Origination.